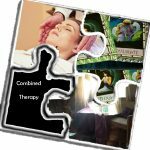 Combined therapy is a form of somatic therapy that looks at the connection of mind and body and uses both psychotherapy and physical therapy for holistic healing. This combined therapy helps with stress, anxiety, a specific worry, grief, bereavement, social anxiety, confusion, depression. In this session you will gain from 3 perspectives. 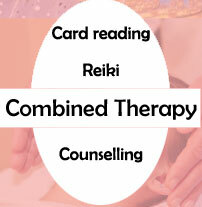 After an initial consultation, Psychotherapy, reiki healing and cards are used to help with a specific or general issue. We are more than a physical being; we are a physical, mental, emotional and spiritual being. The 3 approaches reiki healing, angel cards and counselling skills support your whole being. Reiki is a deeply relaxing therapy, card readings give insight and guidance and counselling can help you explore life challenges from a different perspective. This combined approach offers healing, guidance and emotional support to all parts of your being. This gives a deeper healing and is a holistic approach to wellbeing. How many sessions will I need? This can range from one session to a number of sessions. You may feel that after one session you get what you need and you are happy with just one session. Sometimes you may feel that a number of sessions will be needed, as often a session can highlight other areas that you need to work on and you may wish to continue with regular combined sessions. The cost of this combined therapy is €90 euro per session. Each session lasts 1.5hrs. Emma is an IACP accredited and qualified, experience counsellor/ psychotherapist, trained Reiki master with over 10 years experience and skilled card reader. This combined approach incorporates skills from all 3 perspectives to give you an in-depth and deep healing. This is a complementary therapy and not a replacement for conventional treatments. Complementary medicine is used in addition to conventional medicine, not as a replacement.